Product code: R842 Categories: Antique, Antique Brooch. Here is such a lovely and elegant early Australian 15ct gold antique garnet brooch from the 1870’s that will look so beautiful on any outfit. The colour of the 15ct gold has such a wonderful warm colour and the design of this brooch is typical of early Australian jewellery of the Victorian era. With a beautiful tactile feel to it, in the centre of the brooch is an almandine garnet which has a lovely purple-red hue to it. The stylish floral design of the brooch is often seen in Australian jewellery of this period and the brooch measures 29.5mm across by 29mm. 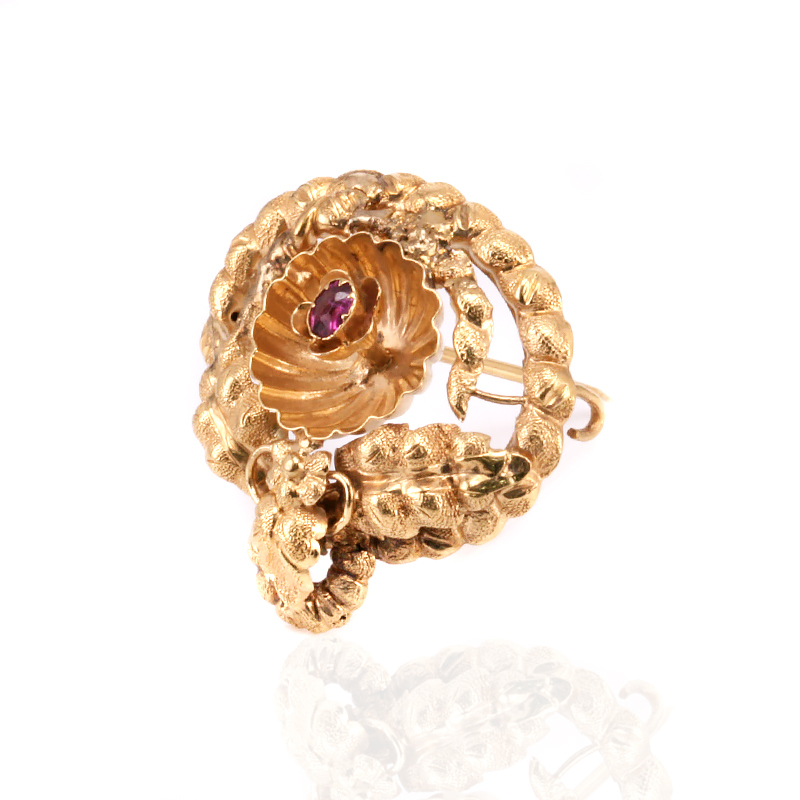 With a gorgeous colour emanating from the gold, combined with both the garnet and the design, this lovely antique brooch will always look so elegant on any outfit no matter where or what time of the day it is being worn. This is a lovely early Australian 15ct gold antique garnet brooch from the 1870’s that has all the qualities and style of early Australian jewellery. Australian antique jewellery is becoming so sought after and rightly so. With influences from England often in the jewellery, there is also a style all of its own. Incorporating the local fauna and flora, antique Australian jewellery is one form of jewellery to keep a close eye on.